“Why would anyone want to keep honeybees on their property? They are a nuisance with their stinging, buzzing and attacking! Besides, beekeeping is dangerous and expensive!” This is what I hear from people all the time when I start talking about “my girls.” Hopefully I can help you understand that these statements couldn’t be farther from the truth. First of all, yes bees do sting. But I want you to understand something about bees. They are very different from wasps, bumble bees and hornets. The honeybee’s stinger is barbed at the end, just like a fish hook. So when the honeybee stings you, the stinger and part of the bee’s abdomen are left behind, causing the honeybee to die. So a honeybee is not going to go out of her way to sting you for no reason! Wasps and hornets on the other hand have a stinger like a hypodermic needle and they can sting repetitively. Since the honeybee can only sting you once and consequently dies, it is safe to assume that honeybees are not as likely to attack you as a wasp or hornet. The only reason a bee would attack, is if you are attacking their hive. Now I am sure you are thinking, “Big Bear, don’t you have to get into the hive to harvest the honey?” The answer to that is YES. Notice I said, attacking their hive. With the right tools and practices, you can get into your hive without your bees seeing you as an imminent threat. I will cover that more in a later page. Now as to the part about bees being expensive. This statement depends on how resourceful you are. If you don’t want to put any effort into saving money, you could easily spend over a thousand dollars to get started. But, since most of you are homesteaders, I would assume that you can find most of the necessary tools at a much lower cost. For instance, instead of buying brand new beehives, you might contact your local beekeeping association to see if anyone has hives they would like to get rid of. You can also look on resale websites on the internet. My only caveat with this is to be sure that the hive body and frames are pest free. Once you get wax moths or hive beetles in your hive, it is hard to keep them out. You can also make your own hives and frames, but I would only recommend doing this if you are proficient with power tools! As far as getting bees, there are two options. You can get online and purchase a nuc, short for nuclear hive. These can run anywhere from $100 to $350. But on the other hand, if you can catch a swarm, your only cost is your time and maybe a little gas money. Besides being free, swarms are good to catch because the bees are already familiar with the area for foraging. This makes it easier for the bees to adapt so they can use all their efforts in making new comb for honey storage. If you are resourceful, you can easily recoup your investment cost with the first honey harvest. Most homesteaders like everything on their property, including livestock, to have many uses. Bees are no different. Obviously you can use them to produce honey. But typically a strong hive can produce more honey than one household needs. So, we use some of the honey for our own supply and sell the surplus for added income. Other uses that are seldom tapped into are: beeswax, pollen and propolis. All of these can be harvested and sold, with a little bit of effort. Here on our homestead, we don’t mess with the pollen and propolis, but we most certainly used the beeswax. You can make everything from candles to lip balm to furniture wax using the leftover wax after honey harvesting. BUT the main reason that anyone should want to keep bees is that bees are responsible for pollinating 98% of all fruits, flowers and vegetables. By adding honeybees to your property, you are helping your garden or orchard grow. You are also encouraging everything on your property to grow, thereby providing food for your livestock. And by growing a garden or orchard, you are encouraging your honeybees to stay much closer to home. Bees in my opinion are the key to a sustainable food source on any homestead. 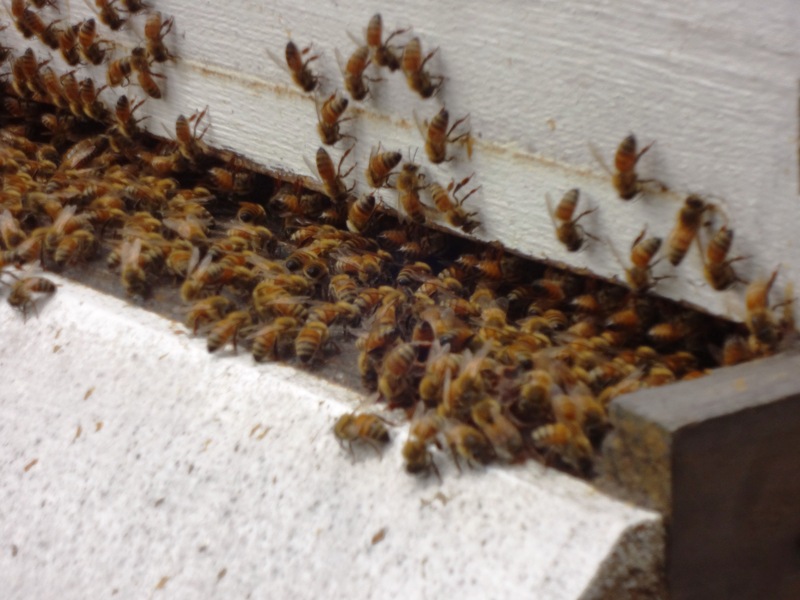 So my question to you is: WHY WOULDN’T YOU RAISE HONEYBEES ON YOUR HOMESTEAD?